PHP. Provides tools for PHP 5.x development, Zend and Symfony Framework support. Includes Java Runtime Environment and does not require a separate Java installation. The size of the installer varies per OS and also by technologies selected. Java JDK is required to be installed in your computer. As an option you can also download the JDK bundled with NetBeans IDE. After installation you can also remove or add technologies in the IDE's Update Center. For Linux platforms, the installer file has the .sh extension. For these platforms, you need to make the installer files executable by using the following command: chmod +x . Type ./ to run the installer. Click Customize. In the Customize Installation dialog box, make your selections. If the GlassFish Server Open Source Edition 4.1.1 installation page opens, accept the default installation directory or specify another installation location. At the Summary page, do the following: Verify that the list of components to be installed is correct. Select the Check for Updates check box if you want to check the Update Center for possible updates. Verify that you have adequate space on your system for the installation. Click Install to begin the installation. Note: If you encounter problems successfully completing the software installation, see [Troubleshooting] for descriptions and suggested workarounds for unresolved issues that could affect the installation process. 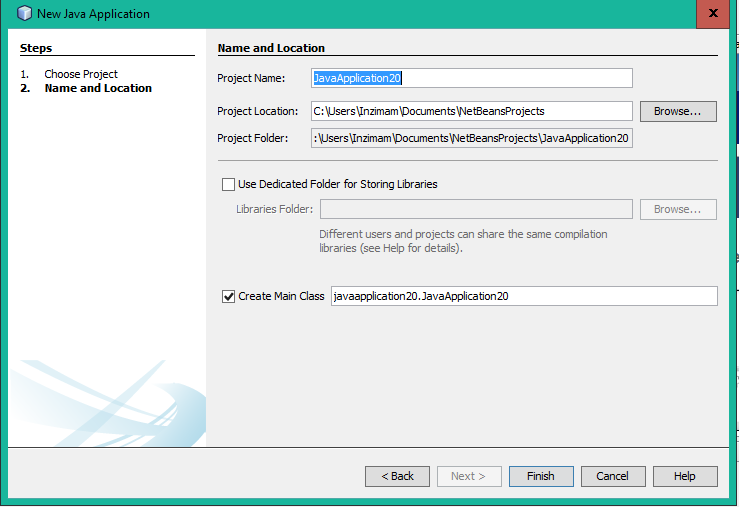 Enter the location of a compatible JDK installation for the netbeans_jdkhome option. The default location in Windows is C:\Program Files\Java\jdk1.7.0_67 or similar. The Java SE Development Kit (JDK) 7 Update 10 (or later) or JDK 8 is required to install NetBeans IDE. You can download the latest update of JDK 7 and JDK 8 at http://www.oracle.com/technetwork/java/javase/downloads. The PHP and C/C++ NetBeans bundles only require the Java Runtime Environment (JRE) 7 or 8 to be installed and run. JDK 7 or 8 is required if you are planning to use any of the Java features. Unlike previous versions of NetBeans IDE, NetBeans IDE 8.1 does not require that you set up an "FX-enabled" Java platform in order to utilize JavaFX support in the IDE. You can develop JavaFX projects in the IDE if you install any standard Java platform that is JDK 7 Update 6 (or newer) or JDK 8. To use JavaFX features in NetBeans IDE, we strongly recommend that you upgrade your JDK version to JDK 7 Update 10 (or newer) or use JDK 8. Note that the version of Glassfish provided with NetBeans IDE is not up to date with security fixes and is provided as a convenience. As a consequence, NetBeans users should upgrade to the most recent version of Glassfish when deploying NetBeans IDE and should upgrade to new versions of Glassfish whenever Glassfish distributions include new security fixes. Glassfish upgrade instructions are provided at MOS note 2073920.1. So, you have completed installation it's time now to Run you program with it. Netbeans has created a shortcut to your desktop, "Double click" that to open the IDE. 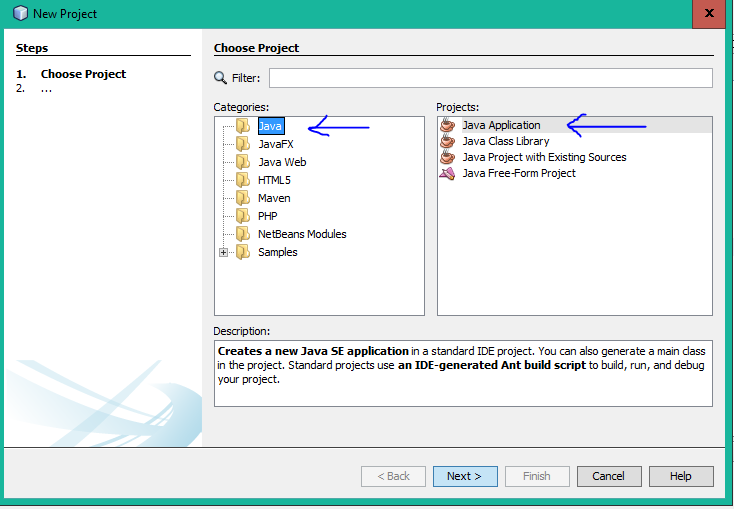 Select Java from categories (from the left side) And Java Application from projects (form the right side) as indicated in the image above. Provide an appropriate "Project Name" You can name it anything you want But it's Good to name it relevent to your work. You can change the location of your project folder by clicking on Browse... button. If you want Netbeans to create a class for you automatically then keep the "Create Main Class" checkbox checked. It may have some comments don't consider that right now.